Have you ever had a horse puke a rainbow on you? 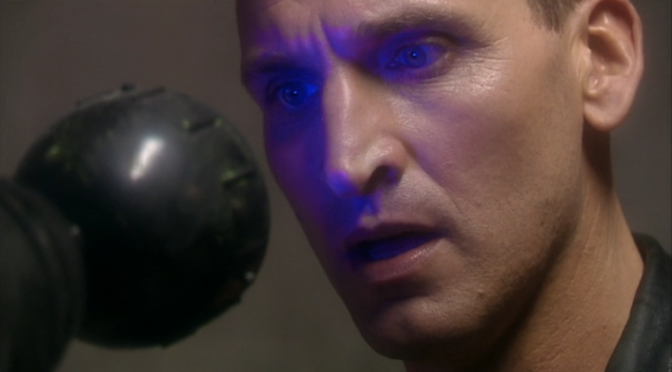 “Dalek,” the sixth episode of the new Doctor Who series, is the first 9th Doctor episode I really took to. This has a lot to do with it featuring such a classic antagonist as the Dalek. Their tank design and robotic voices really grew on me while watching the adventures of the 11th and 12th Doctors, and I enjoyed seeing all the swiveling of the head and torso and hearing all the variances in the Dalek’s voice as it struggled with emotion. The regeneration scene, the opening and closing of the armor, and the destruction scene were all just bonuses for an episode which really showcased the Dalek design. All the scenes with the Doctor and the Dalek and Rose and the Dalek are great, as they deal with questions of ethics and individual purpose. This episode is one of those stories I am a sucker for: where evil shows it is capable of good, and good shows it is capable of evil. Furthermore, it’s a great companion episode in that Rose plays the conscience, guiding not only the Doctor but the Dalek as well.